Book Your Walleye Trip Now! We are an experanced network of Oregon and Washington guides with many years of experience fishing the Columbia River for both trophy walleye and eating size walleye. We pride ourselves on guiding our clients into some of the most productive walleye fishing in the northwest. 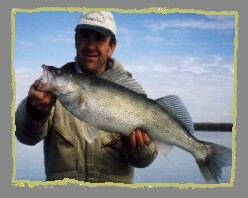 Guided river walleye fishing is our speicalty. Up to five clients will enjoy fishing for waleye from the comfort and safety of a late model 23-25 foot guide boat. Larger groups of six or more will be divided into multiple boats that will fish the same general area. All walleye guide boats are coast guard inspected and fully outfitted with padded swivel seats and a canvas top for inclement weather. Most are outfitted with modern electronics and LCD fish finders which aid in locating fish. The Columbia River drains a 259,000-square-mile basin that includes territory in seven states (Oregon, Washington, Idaho, Montana, Nevada, Wyoming, and Utah) and one Canadian province. 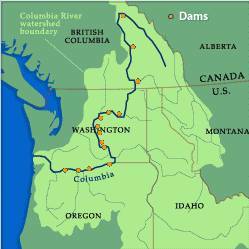 The river is arguably the most significant environmental force in the Pacific Northwest region of the United States. It flows for more than 1,200 miles, from the base of the Canadian Rockies in southeastern British Columbia to the Pacific Ocean at Astoria, Oregon, and Ilwaco, Washington. Oregon walleye fishing is some of the best in the world and Washington walleye fishing is more of the same. About Columbia River Gorge. Dams slow the current of the Columbia River extending the time it takes for juvenile salmon to reach the Pacific Ocean. The slow current provides salmon predators, such as walleye, a wider window of opportunity and has thus helped the species to flourish. The pooling of river water also allows it to heat up, which increases salmon mortality, partly due to the growing populations of salmon predators, namely walleye, that have adapted over the years to the warmer waters. The dams, along with the over abundance of forage fish, have created the perfect habitat for Columbia River walleye and these species will continue to flourish in its waters. 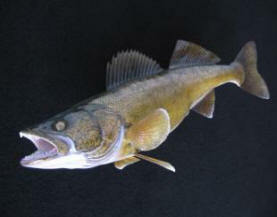 Sometimes referred to as river walleye, wall hangers, bug eyes, eyes, walli, walley or Columbia walleye. They are some of the best eating freshwater fish around. The Columbia River produces big walleye . . . very big walleye. There's no secret about that anymore. Sizes range into the high teens and anglers come to the Magnificent River from all over North America to tangle with a genuine wallhanger, and just maybe, get their name in "The Record Book". 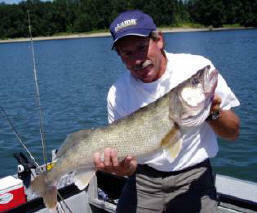 Summer is a good time to catch nice size river walleye and the weather is typically warm and dry. If you are looking for trophy walleye spring has proven to be a good time in most areas of the Columbia River. Below Bonneville Dam the end of August through mid October is a good time. Mothers Day has provided good action at times. January is also a good time to catch walleye and numerous trophy fish have been landed in January, although the weather can be challenging at times with cold wind and rain. Walleyes are caught in the Columbia River from the Washington Canadian boarder to Astoria Oregon. The number of fish being caught is limited in some areas, but our guides only target the most productive areas where the fish are plentiful and large. 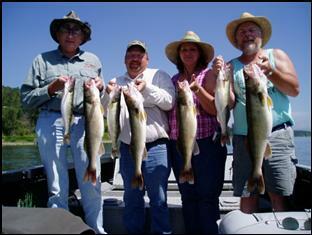 Numerous locations exist where we begin our guided walleye trips along this stretch of the mighty Columbia, including, but not limited to; Banks Lake (WA), below Grand Coulee Dam (WA), Pasco (WA), below Mc Nary Dam, Umatilla, Hermiston, Irrigon, Boardman, below John Day Dam at Rufus and mouth of Deschutes, below Bonneville Dam, at The Fishery, near Fairview at Chinook Landing, near Portland airport and also several locations in Portland on both the Columbia River and Willamette River. Send mail to webdesign@abproguides.com with questions or comments about this web site. All photos, copy and artwork are copyright protected under the "Digital Millennium Copyright Act." Those who infringe on these rights will be prosecuted to the full extent of the law.